As you’ve probably noticed, pearl embellishments are everywhere right now. Lucky enough for us, this trend is super easy and inexpensive to DIY and is the perfect way to elevate your everyday denim! So we turned to our Creative Operations Coordinator, Sierra Clair, to take us step by step through how to customize your favorite jeans and jacket with a little sparkle and luxe. Your denim item(s) of choice! 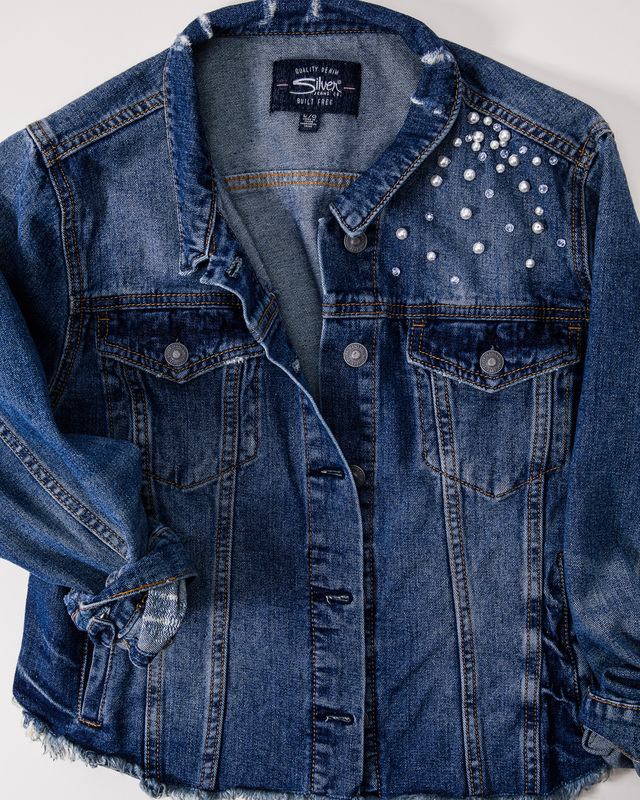 Let’s create the spray look on the front yoke of spring’s new must-have denim jacket. Start by placing the bigger pearl beads towards the top of the shoulder on one side, creating a cluster that is still close together. 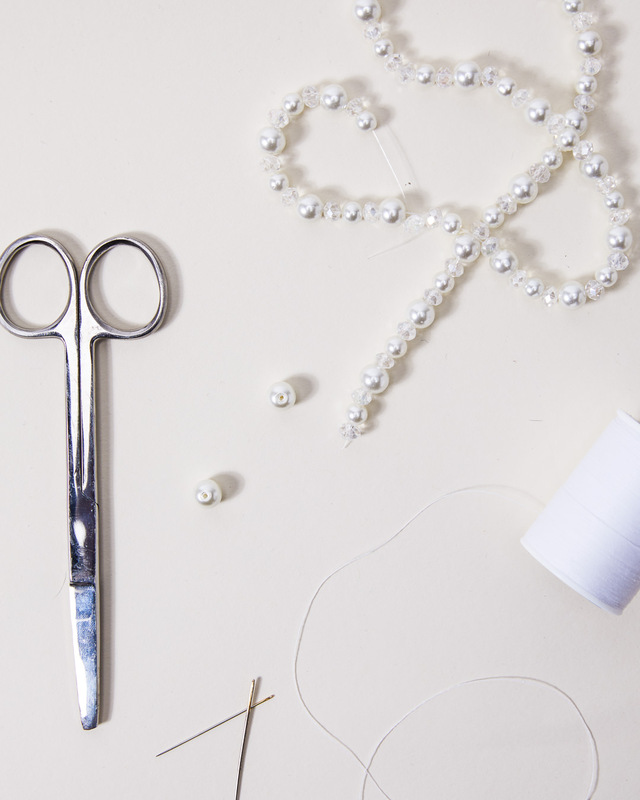 Secure each pearl bead individually with the needle and thread, double knotting the thread to ensure it stays in place. Start spreading them out slightly as you move towards the outer edge of the jacket, leaving even more space between beads as you move down. Once you have a good cluster on the top half of the yoke, start adding in some smaller pearl beads and crystal beads if you have them in between the current clusters. Again, spread the beads out as you move away from the shoulder to create the spray effect. Count the number of pearls you used and repeat as best you can on the opposite side. 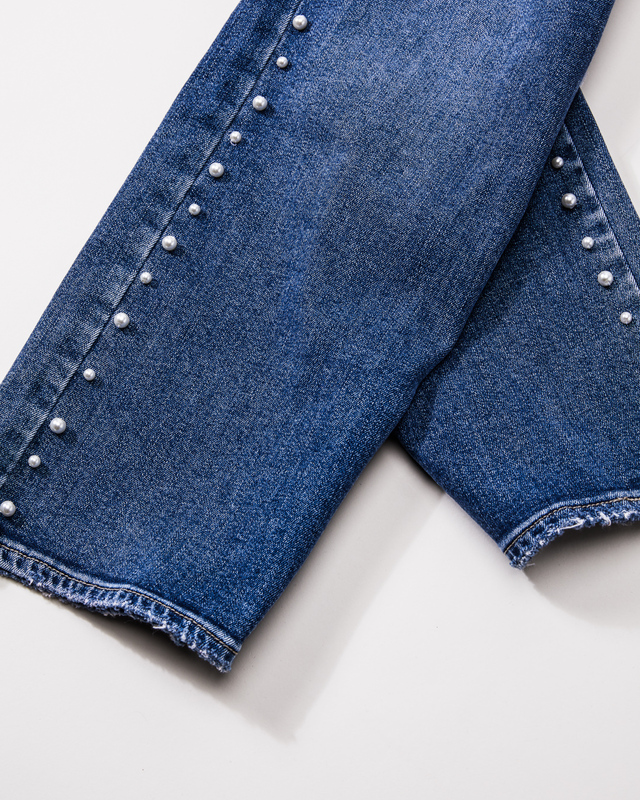 For the jeans, place the pearl embellishments as close to the outside seam of the jeans as you can. We’re using our new Calley Straight Leg jeans, a super-high rise curvy fit. Start by alternating one large pearl and one small pearl, making sure they are equally spaced as you move down the seam. Begin to attach the pearls with your needle and thread, whether you want to do it individually or using the same thread for each one. Tip: If you are using the same thread, I recommend stopping halfway down and starting from the bottom again to help keep the line straight. 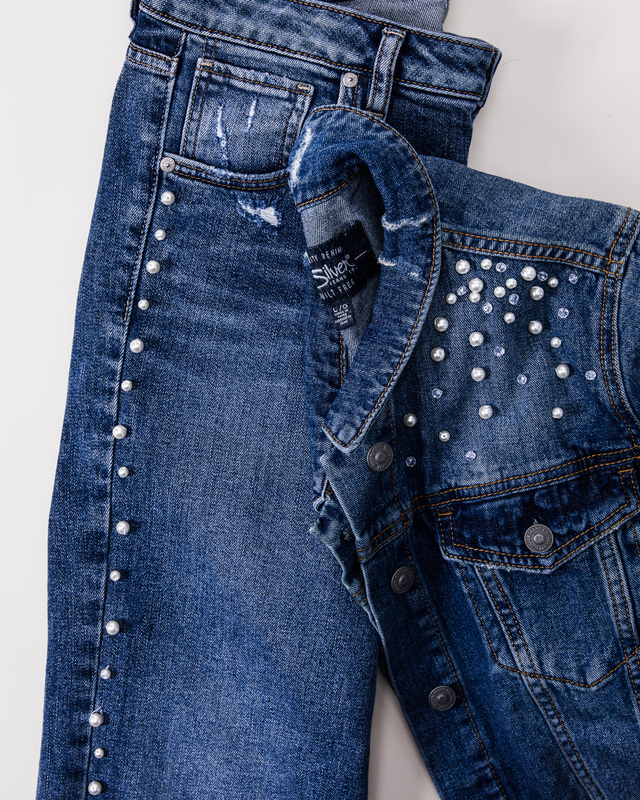 Enjoy your new pearl-embellished denim-on-denim outfit! Mix, match and wear over and over again. See how Sierra styled it on Instagram @cerisesdumatin, and make sure to share your own denim DIY with us using #silverjeans! denim diy diy idea easy diy pearl embellishment pearl trend silver jeans co.